Look forward to a Bridal fashion show, a Cake Competition, hair and make-up consultations plus many vendors for shopping opportunities. 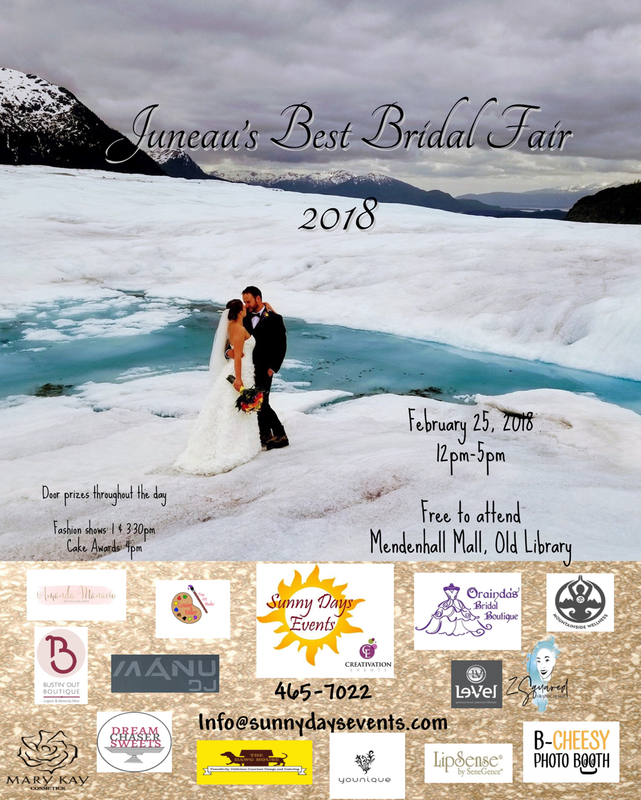 Schedule a personal bridal gown appointments with Orainda’s Bridal from Anchorage! Hosted by Sunny Days Events. ​SDE is a local wedding planner, coordinating and rental company perfect for a bride with any budget! If you are interested in a conducting a 15 minute expert presentation on a wedding related topic. For example: "What makes a good first dance? ", "How to write your vows" or "What to include in you invitations". Recommend your favorite at-home or professional baker! $15 - 15 minute expert presentation. No table. Fliers will be printed February 28, 2019. Deadline is February 8th for event sponsorship. Please come with your completed show cake by 11 am and provide 6 pre-prepared cupcakes for the flavor portion of the judging. Open to professional and amateur. You will be judged in best flavor, most thematic, best decorations, most dramatic and overall. No one is allowed to show and hand out cards or literature to attendees without contracting and paying for booth space. If you do not have staff available to sit at a booth, we have a marketing materials table for $20 fee. If you would like to “share” a booth with another vendor, you may but you are also subject to this $20 fee in addition to the regular booth price.